The latest Android phone to launch in the US is the lightweight Dell Aero. The Aero offers business professionals a compact device that’s easy to carry anywhere. With CompanionLink, users can sync the Dell Aero with Outlook, Palm Desktop, Lotus Notes, ACT!, and other PC contact managers. CompanionLink’s sync with the Aero allows users to sync, view and edit contacts, calendar, tasks and notes right from the device. Changes made on the Aero will sync back to the PC. Gmail now has voice calling functionality. You can call any standard telephone number right within Gmail. If you have your contact information stored in Gmail, calling a contact is as easy as just clicking on their Contact record. Small businesses can save hundreds on their phone bills if they use this feature to place calls to people in their Contact List. The catch is that managing Contacts in Gmail can be cumbersome. Many small businesses use PC software like Microsoft Outlook to manage their contacts and phone numbers. If only there were a way to continue managing contacts on the PC, while having Gmail automatically receive those changes. Wait – that’s the whole point of CompanionLink for Google! It will keep your PC software (like Outlook) in sync with your Gmail Contacts. Update a phone number in Outlook and it will automatically update in Gmail. Last week, RIM launched the BlackBerry Torch 9800 with the newest revision of the BlackBerry platform, BlackBerry 6 OS. CompanionLink supports sync with the BlackBerry Torch using one of three methods: direct USB sync, wireless sync through Google, and automatic handsfree sync using CompanionLink’s secure wireless service.Visit www.companionlink.com/torch for more info on how to sync the BlackBerry Torch 9800 with ACT!, Lotus Notes, Outlook Business Contacts Manager, GoldMine, Palm Desktop and more. USB sync with the BlackBerry Torch works in tandem with RIM’s BlackBerry Desktop Software. With the Torch launch last week, RIM also launched a new version of the desktop software, BlackBerry Desktop 6. The new Blackberry Desktop 6 changed some underlying core functionality, which caused most 3rd party add-ins, including CompanionLink, to break. We scrambled to quickly find a fix, and our awesome development team got things quickly working again for all our BlackBerry users. If you use CompanionLink with any BlackBerry, visit www.companionlink.com/bb6 for the latest information regarding BlackBerry Desktop 6. CompanionLink will sync data from Outlook folder. The software will list the available folders (even Public Folders if you’re using Exchange), and let you choose which on to sync data from. CompanionLink will synchronize data in that folder and any sub-folders under it. To synchronize data from multiple different Outlook folders, you need CompanionLink Professional. This version has as a feature called Category Manager that allows you to assign synchronization of different folders to a Category on the phone. When you add a new Contact to the right Category on the phone, it automatically goes to the right folder in Outlook. Category Manager also works great with the DejaOffice app for Android, iPad and iPhone. Datamation published an article written by IT analyst Jeff Vance highlighting the top smartphone apps for mobile productivity. Jeff recommends the DejaOffice app as a great way to keep contacts and calendar events organized. The app allows advanced features like linking contacts to calendar events and creating categories. DejaOffice is a contact-manager app suite with modules for calendar, contacts, tasks and notes. It is currently available at no cost for Android, iPhone and iPad. The Motorola DROID 2, available today, is the next big Android phone to land here in the US. It follows on the heels of the original Motorola DROID, one of the top selling Android devices thus far. New owners looking to sync the DROID 2 with their PCs have few options. Google provides the free Google Calendar Sync tool to sync the primary Outlook calendar with any Google account. The Motorola DROID 2 has built-in support to sync contacts and calendar with a Google account through its wireless data connection. However, this solution is limited to only the primary Outlook calendar, and no support for contacts or other data types, such as tasks and notes. CompanionLink offers two ways to sync the DROID 2 with Outlook – wired USB sync and wireless sync through Google. CompanionLink’s wireless sync via Google supports two-way sync of contacts and calendar, and offers the ability to sync multiple Outlook folders. 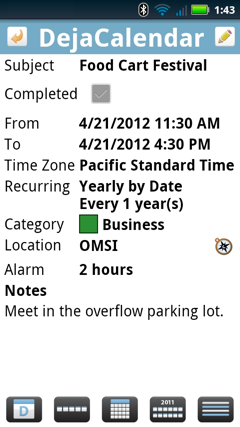 CompanionLink can also sync Outlook tasks to the Google calendar as untimed entries. CompanionLink’s USB sync with DROID 2 works in conjuction with an Android app called DejaOffice. DejaOffice is a contact manager application suite with modules for contacts, calendar, tasks and notes, with support for advanced features such as categories. Outlook data will sync to the DejaOffice business apps for the DROID 2. Read the full press release here, then get DejaOffice free in the Android Market. Visit www.dejaoffice.com for more info. Earlier this week we posted a new video showing you how to sync Outlook with Android via Google. Today we have another new video, this time showing you how to sync Outlook with Android direct over secure USB using the new CompanionLink 4.0. CompanionLink’s USB sync with Android works in tandem with DejaOffice, a suite of contacts, calendar, tasks and notes apps for Android-powered devices. Allows sync from Outlook or Palm Desktop to any Google, Gmail or Google Apps account. Sync happens over-the-air. Allows sync from Outlook or Palm Desktop directly to Android or Palm webOS devices using USB cable. Secure and fast exchange of data without going through Google. Allows sync from ACT!, Lotus Notes, GoldMine, and GroupWise to phones or Google. Includes everything the Express version has plus advanced CRM-like features such as Opportunity sync, support for multiple data sources, and an optional wireless sync subscription. All prices are one-time charges. Technical support by phone and email are included at no extra cost.